Flowers are often one of the things you’ve been dreaming most about when it comes to planning your wedding. But they are also super confusing. Why does one bouquet cost more than another? Are flowers REALLY that seasonal? 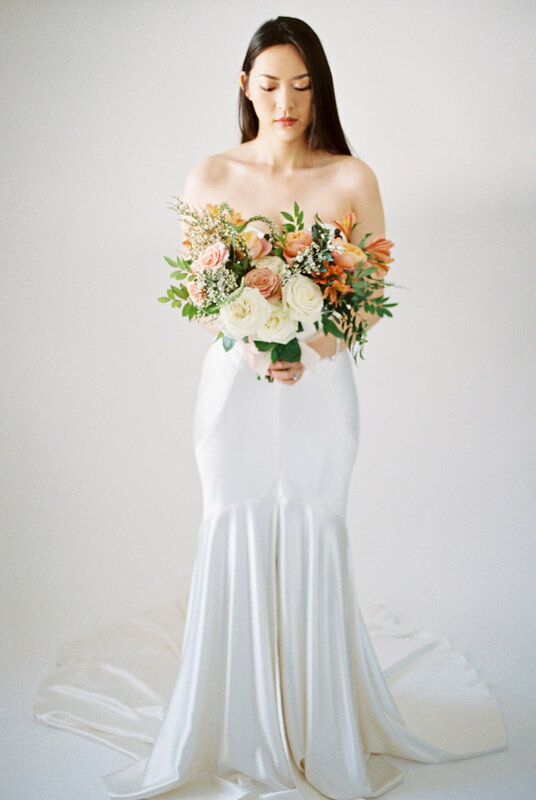 I am here (in conjunction with Emma Lea Flora and Sara Lynn Photo) to break down the basics of wedding bouquet pricing! For even more information and photos, check out the amazing feature on Style Me Pretty! Why do bouquets vary so much in cost? Pricing of bridal bouquets is dependent on many factors such as size, style, season, and floral choice. A modest and affordable bouquet might emphasize simplicity by using a smaller variety of flowers, more greenery, and more affordable blooms. Increasing the size of a bouquet, using premium blooms, and limiting the use of greenery will all increase the overall cost of a bouquet. With the exception of certain styles, a well-rounded bouquet will feature a variety of textures, greenery types and bloom sizes. This bouquet was created using a few simple and affordable ingredients with texture and dynamic shape to create visual interest. Large, open standard roses created much of the structure with greenery and textural blooms throughout for added shape and detail. Alsotroemeria, a flower commonly overlooked for weddings, adds bright color and airy detail to the bouquet. An affordable bouquet can still have gorgeous elements such as a few well-placed garden roses and fruited blackberry. The stems of this bouquet are simply and cleanly wrapped with satin ribbon. This bouquet price allows for a larger sized bouquet along with a variety of premium blooms. In this specific design, antique hydrangea adds rich color and texture. These expensive blooms fill much of the bouquet making it more cost effective and leaving room for other gorgeous blooms such as garden roses and white lilac. These premium blooms offer a variety of textures creating a more interesting composition. Greenery is tucked throughout this bouquet but more for color and texture rather than size and shape. The stems of this bouquet are wrapped in premium hand-dyed silk ribbon with a loose bow and tails. A bouquet in this price range is certain to be a show stopper. Using almost entirely premium blooms, this bouquet is meant to create a visual statement through size, color, and a mix of textures. Large delphinium blooms create dynamic shape among roses, garden roses, and white lilac. Smaller blooms such as ranunculus, scabiosa, hellebore, and lysmachia are used for colorful and textural detail. These smaller, more delicate blooms are great for creating depth but do not add much of a structural base making them relatively expensive choices compared to sturdier, larger blooms such as roses. The stems of this bouquet make a statement of their own featuring a variety of hand-dyed silk ribbon streamers. 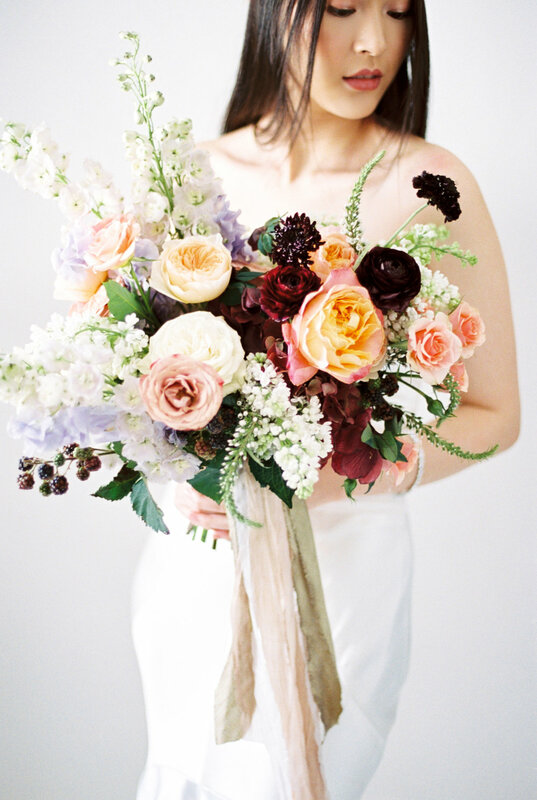 I hope that this breakdown helps to demystify wedding bouquets! Coming up next, wedding bouquet FAQs!